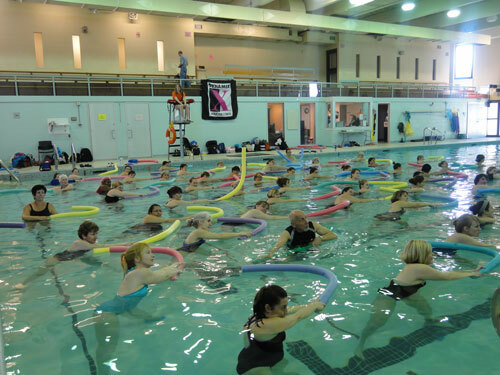 How much do you know about Aquafitness? Below are a few questions to test your knowledge. 1. Who benefits from Aquafitness? 2. Do I have to be a swimmer to do Aquafitness? 3. Is it okay to do the exercises at my own pace? 4. Does the temperature of the water impact on the type of class? 6. Is it important to use an Aqua Safety Mat? 7. What are the 3 characteristics of water? 8. What are the magical properties of water? 9. What is the recommended bmp range for Aquafitness - chest deep and deep water? 10. What is the relationship between speed and resistence? 11. Even though air temperature is usually around 22 degrees C and the pool water is around 25-32 degress C, why does the person feel colder in the water? 12. What are the components of a class? 13. What is the purpose of the warm-up portion of a class? 14. What does F.I.T.T. Principle stand for?